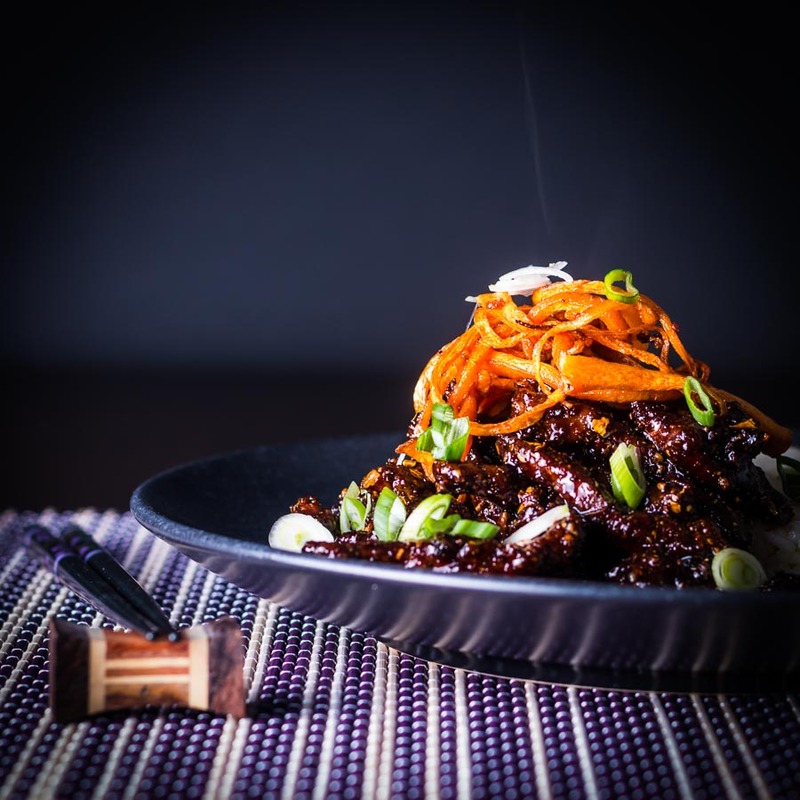 Sticky Chilli Beef is my idea of an indulgent treat, sure it is not the most ‘health conscious’ meal but boy does it taste fantastic! Chinese Style Sticky Chili Beef. 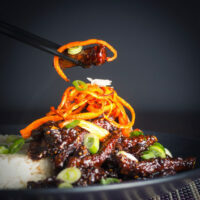 Sticky chilli beef is a dish that just makes me feel warm and fuzzy inside. 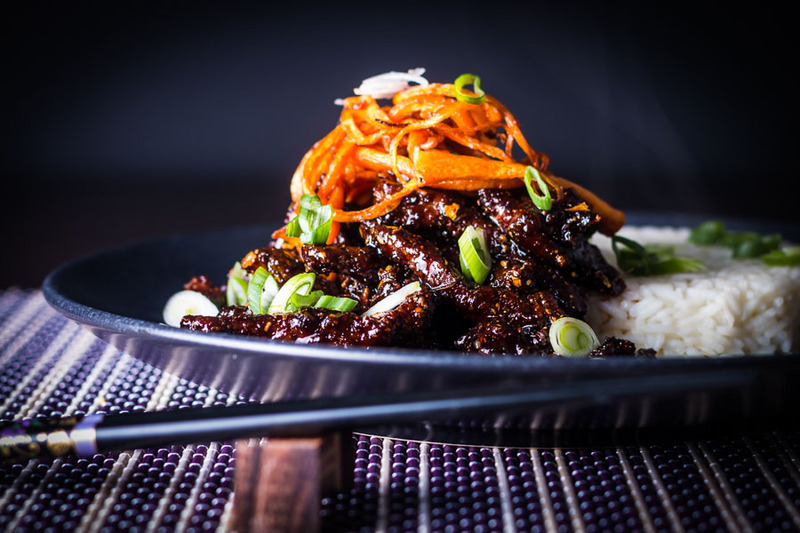 If you have a lower tolerance to a bit of spice then feel free to knock back the levels on this sticky beef recipe. It is definitely one that my wife puts on a coating of chapstick before eating! I have waxed lyrical about my love of ‘fakeaways‘. It is a little odd as we would probably only order a takeaway once a month in the UK. However, suddenly discovering that you can not have something makes you want it even more. That is definitely where my sticky chilli beef recipe comes from. It is sweet, spicy and salty, a perfect trifecta of flavours. 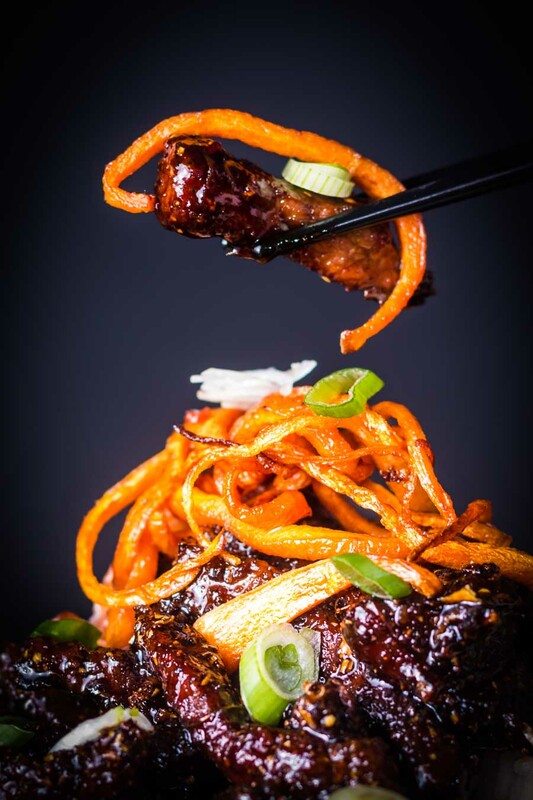 The crispy orange and Szechuan crumb on the crispy beef also makes this a recipe I love to eat. I am hankering after a particular type of food at the moment. Both this and my previous Chicken Drummer dish seem to really epitomise exactly what I want to eat at the right now. The Secret To Chinese Crispy Beef. This sticky chili beef recipe is built on a pretty classic Chinese Crisp Beef. The key to cooking crispy beef is all in the cornflour, you will note that it appears in a host of my ‘batter’ recipes too. Cornflour is referred to as cornstarch in the US. For once they are more accurate in their descriptions of food! Yes, I went there, Entree, really? Anyway, I digress, cornflour is actually pretty much pure starch. It is those starch molecules that form the atypical crispiness associated with Asian fried food. So if you want a crispy fried dish, whether it by Sticky Chilli Beef, General Tso’s Chicken or even the very British Fish and Chips then reach for the Cornflour/starch! The Role Of Indulgent Food. If you read my site regularly you will know I am not a health ‘Nazi’. Food is always about more than just nourishment! It is about smiles and laughs and making your belly feel loved. Now I certainly don’t advocate eating fried food all of the time, but a little bit of indulgent food does the soul some good. So long as you have a balanced diet in really does not do the waistline any harm at all. I quite often read websites that are far too busy waxing lyrical about how great this food or that food is for you. Or even worst ones where writers go to great effort to tell you what is NOT in their dish. Seriously I stumbled on an ice cream last week that didn’t tell me what flavour it was until I scrolled to the recipe. I have no idea why I continued that far, I think it was incredulity to be honest. Yes this dish has a fair bit of sugar in it and it is deep fried… Guess what? It tastes all the better for it. I don’t really eat dessert it is kinda odd that I have a fondness for savoury dishes that have a sweet element. I guess it is just my way of getting sugar, that’s my excuse and I am sticking to it. Essentially I need sticky chilli beef in my life in order to maintain a well balanced diet! 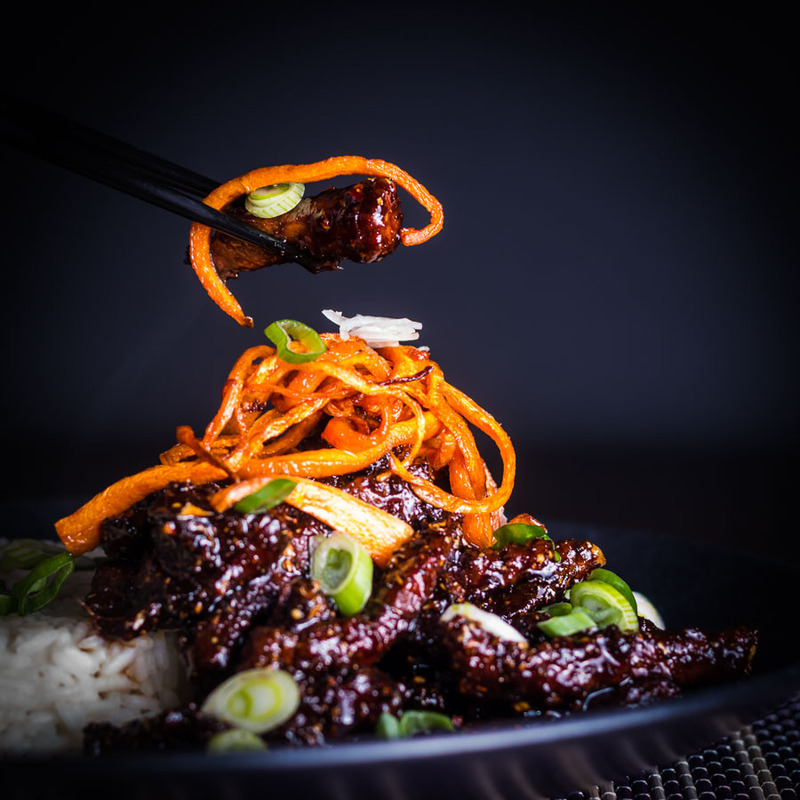 Sticky Chilli Beef is my idea of an indulgent treat, sure it is not the most 'health conscious' meal but boy does it taste fantastic! Toast the Szechuan peppercorns in a dry frying pan over a high heat for a couple of minutes, taking care not to burn and grind in a spice grinder or pestle and mortar. Mix this Szechuan pepper with the cornflour, orange zest and salt. Coat the beef with the 2 Tbsp cooking oil and then add the beef to the cornflour mix and coat. Heat a small pan over a high heat and when fiercely hot add the rice wine. Then immediately add the brown sugar, soy sauces, chili flakes, sweet chili sauce and ginger to a saucepan and bring to a boil, cook on at a furious boil for a further 3-4 minutes until it begins to thicken then set aside. Heat the oil for frying the beef to 170°C and fry in small batches for 2-3 minutes maximum and set aside on some kitchen towel to drain. When all of the beef is fried, then fry off the carrot strips and again set aside on kitchen towel. Now return the sauce to the heat and add in the beef and ensure it is all coated. Now build your dish, I like to add the fried carrots to the top of a pile of the beef and then sprinkle some spring onions. I like to serve this with plain boiled rice. I found this recipe on Yummly, so this is just to share what I wrote there. One of the culinary highlights since I got Yummly. There’s quite a lot of prep and multi-tasking involved but the results are outstanding. I think next time I’ll serve it with a generous amount of pak choi to balance out the guilt of such a sugary base for that amazing sauce. Because there definitely will be a next time. Thank you for taking the time to comment Mike… I’m so glad you like the recipe, it is an indulgence but one that we really love, the pak choi is a great idea! Oh my Lord, Brian! That beef is calling my name! This dish looks absolutely scrumptious! I allow myself to eat out for lunch during work once each week – usually on Fridays, the ladies and I will head off to the food court at the mall close to the office. I always get the same thing and it looks very similar to this. I’m making the real thing now. Thanks! Only once per week, I insisted on taking lunch every day to make up for the endless hours of unpaid overtime I did… Unfortunately now lunch tends to be what ever I pick out of the garden whilst working. Glad you like the idea of the dish it is a real corker of a recipe, I like it with beef but you could do it with pork, chicken or even play around with it on some Tofu. Loved loved loved this, very decadent but delicious!! Have sent the recipe to my best friends! Um….this just looks A-MAZING Brian! Total comfort food and TOTALLY worth the indulgence! And I wholeheartedly agree with you – I don’t eat fried food a ton, but sometimes a fried version is just plain delicious. This dish is definitely on my to-make soon list. And your photos are stunning! Wow – so many amazing flavours in one dish! Lovely. You make such interesting dishes. Nice work. Thanks Jeff, I like to keep things fresh. That looks so good Brian!! Love sticky anything .. Love the carrots on top of the beef. Sticky chili beef makes me feel warm and fuzzy inside too. With winter here in Aus, this would be perfect. I could eat this dish all year round, in fact I love eating spicy food in summer for some strange reason it cools me down. Oh… my….. goodness…! This looks AMAZING! I have to make this at home, my husband will love it!